There are knitting shops and there are cafes, and it takes a certain genius to combine both to create a cozy salon like L’Oisive Thé. This inviting nook is utterly beguiling, with both the café and the yarn bits complementing each other. Owned by Aimée, both L’Oisive Thé and La Bien Aimée are located in the 13th arrondissement. L’Oisive Thé has been going for seven years, and La Bien Aimée, which was started up to meet demand for some locally produced yarns, has been going for around two months. Between them, both stores stock brands such as Madeline Tosh, Quince & Co, Jamieson, De Rerum Natura, Woolfolk, Freia’s gradient yarns and yarns by smaller producers such as Julie Asselin, Viola, and their own hand-dyed line, La Bien Aimée. They run classes, and you’ll see from their Instagram stream that Aimee is a brioche devotee, with Stephen West having made a guest teaching appearance at the store. Fun, warm – and everyone I met spoke English! This atmospherically moody yarn, ribbon, button, feather, ribbon, cotton, flower, leaf and bead haven is a handmaker’s paradise, and has a reputation as a Parisian institution. They stock their own line of yarns, so it’s a perfect place to stop by if you’re after a French souvenir. They offer an extensive range of La Droguerie patterns and kits for adults, kids and accessories. If you choose and purchase a pattern, they can wind up the yarn for you at the back of the shop. A quintessentially French experience. If you’re up Montparnasse way, the area near the Sacre Coeur still remains a garment and fabric district that draws many a costumier and designer. The largest of the stores is the Marché Saint Pierre: this emporium features five floors of fabric, ranging from the most delicate wedding laces to woollen suitings, exquisite French linens, toiles, cottons and more, all very well priced. This store exudes atmosphere: men walk around holding collapsible wooden rulers to measure and cut your bolt of fabric, then write out a chit for your purchases that you take to an old-fashioned register. The stairs and floors are wooden, the service old-fashioned, and the wisdom hard won. The nearby Les Coupons de St Pierre sell ready-cut fabrics (usually bolt ends of up to 3 metres for about 10 euros, a terrific bargain). Tissus Reine, also nearby, stocks the more upmarket range (think Liberty and laces). Behind the Marché Saint Pierre are two yarn shops, one on Rue Pierre Picard and one on Rue Cazotte. La Mercerie Parisienne is a haberdashery haven in the heart of the Marais that also carries knitting yarns (the alpaca is divine, and they also have the French brand Fonty). Categories: knitting knitting yarn | Tags: knitting, knitting yarn, L'Oisive The, La Bien Aimee, La Droguerie, Paris | Permalink. After moving to Skye from London in the early 1970’s, Eva Lambert started dyeing with natural materials as a way of creating the colours she wanted to use in her work as a tapestry weaver. 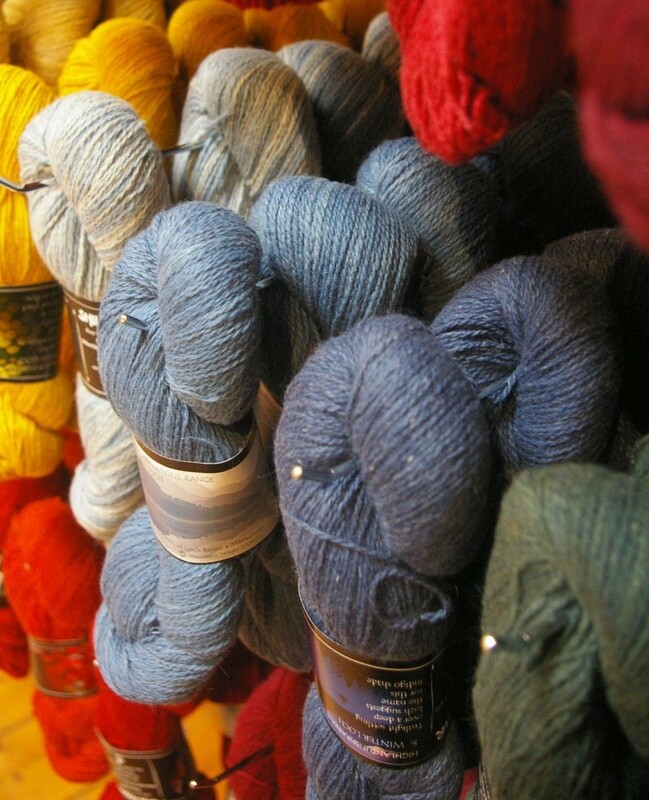 Lots of interest from other craftspeople and yarn shops meant that, before too long, Eva was dyeing full time and had opened Shilasdair, a small yarn shop and studio in Waternish, now a much-loved stop on the Skye tourist trail. 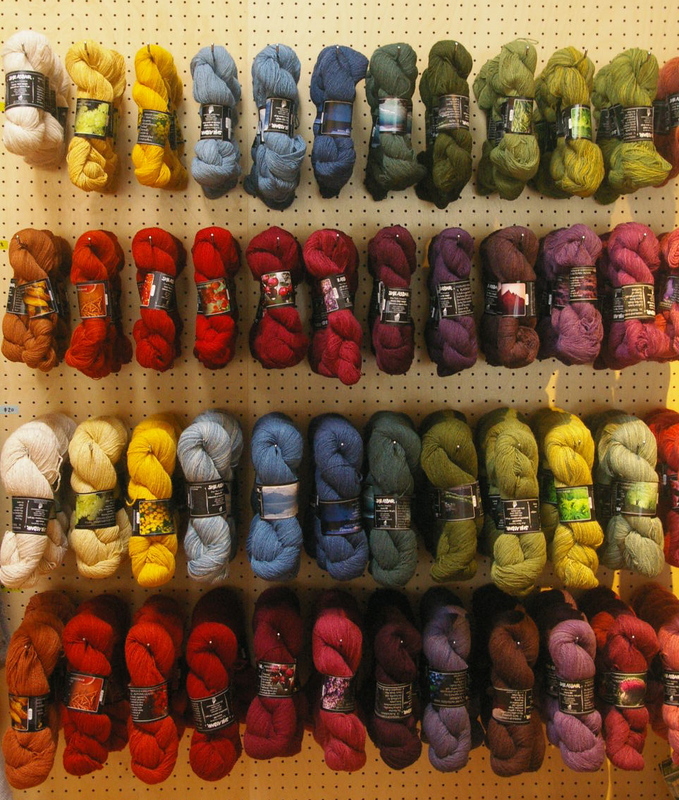 She recently handed over the running of the studio and shop to others, allowing her to concentrate on dyeing large quantities to sell to yarn shops all over the work- like us! We are super excited to be the first shop in Australia to carry Eva’s beautiful yarns. Eva combines locally-available dye plants, such as tansy and meadowsweet that she harvests herself, with exotic cultivated plants, such as madder and indigo, and this combination of everyday and rare plants allows her to create an range of 24 varied and subtle colours. Any given colour may be the result of 2, 3 or more turns in the dyepot, so the process is slow and full of magic. 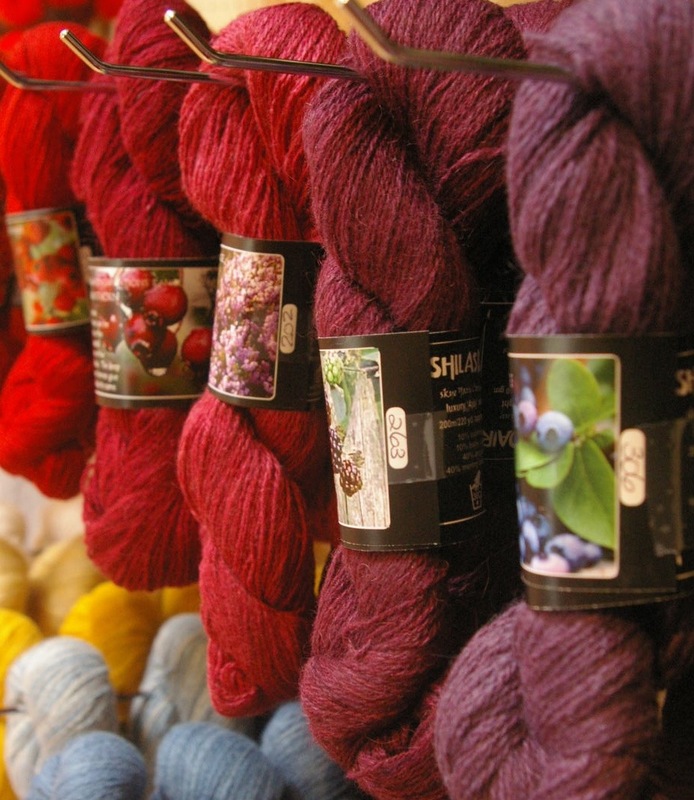 She has developed a system of dyeing 20kg of yarn at a time, so, although shades may be different from batch to batch, the dye lots are large enough to make knitting garments from Shilasdair easy, something that is quite uncommon in natural dyeing. 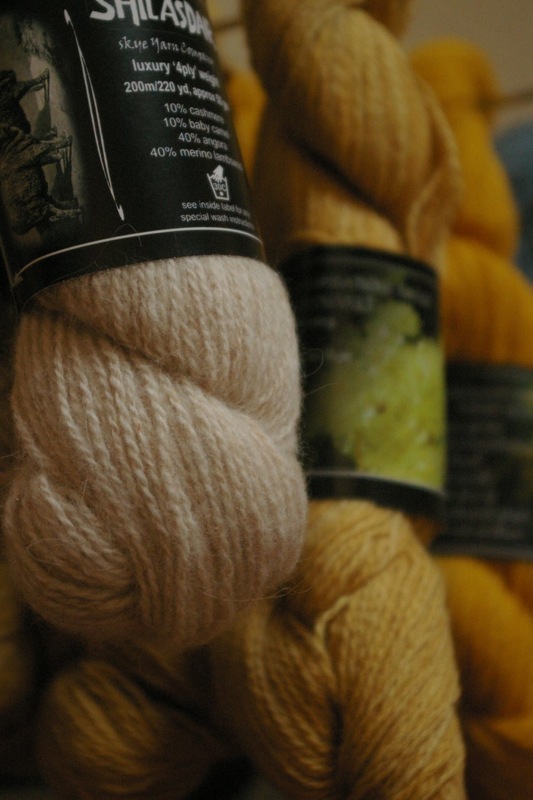 And below, next to the yellows, is the undyed yarn, a lovely, soft fleecy colour that works beautifully with the dyed yarns. 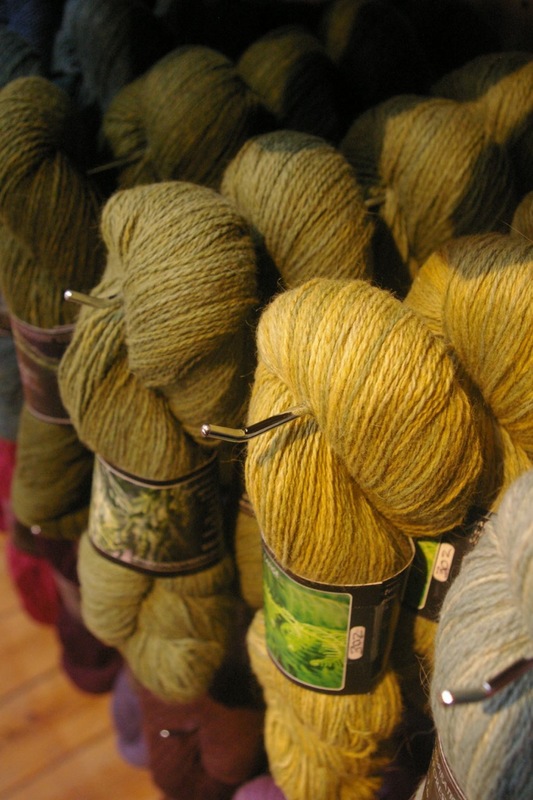 You can see more of the colours at Shilasdair and, of course, in the shop! 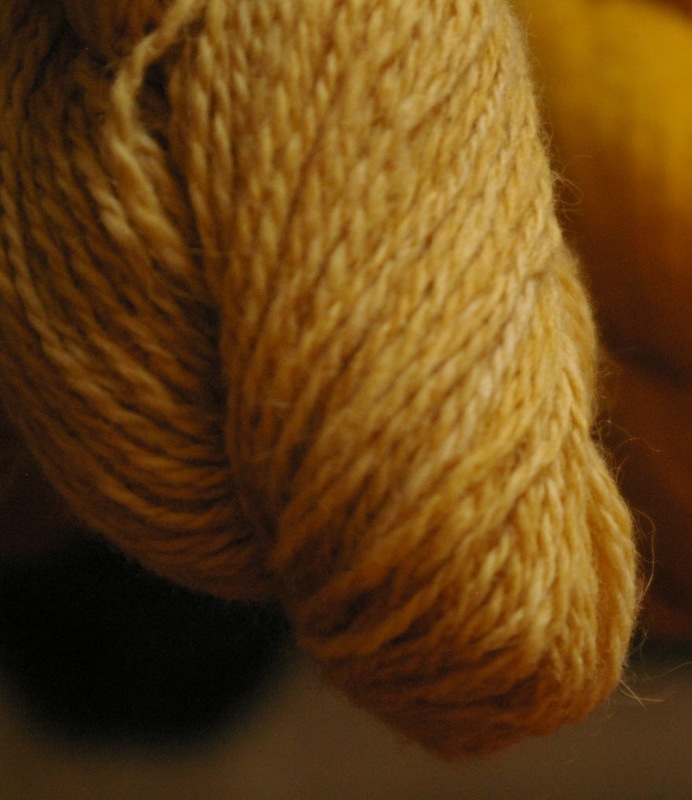 You can also see the lovely texture of the yarn base, a luxurious blend of merino, angora, camel and cashmere. This is the kind of yarn that blooms and softens the more you wear it; it’s plenty soft for childrens garments but is also durable enough to stand up to being an everyday garment. And the slight halo that lifts as you knit with and wash it makes it a perfect candidate for colourwork, ensuring that stitches and colours blend and merge in a wonderful way. So, can you tell how excited we are about Shilasdair?! We hope you love it too. Categories: In focus, Knitting, New, Sunspun news, Yarns | Tags: Eva Lambert, knitting yarn, Melbourne knitting, natural dyes, naturally-dyed yarn, Shilasdair, Shilasdair at Sunspun, wool | Permalink.